In general there are two ways to make estimates on crop yield with the help of remote sensing data. The first uses only remote sensing data, while the second one also utilizes other forms of data, which are used as input in models that simulate the crop growth, and eventually deliver an estimate on the crop yield. 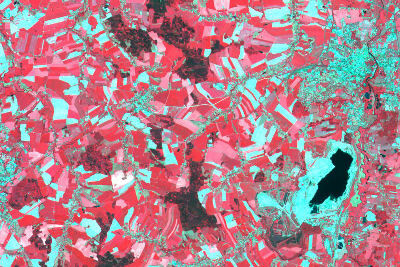 On the right you can see two false colour composite images (with the near infrared, red and green bands showing as red, green and blue respectively), of an area in Saxony in Germany, near the borders with Poland. The images are from SPOT 2 and SPOT 5 satellites and were taken in May and August 2005 respectively. Click on the titles above the image to switch between dates. You can notice that the image taken in May has a lot more "red" in it. High near-infrared reflectance is usually associated with presence of vegetation, because plants reflect high amounts of near-infrared radiation. On the other hand, the August image, has fewer fields appearing red. This is expected because in May many crops are at the peak of their growth, while in August they are either approaching or have entered the stage of senescence. During that period the plant is focusing its energy in producing the crop and not producing green biomass. As a result, chlorophyll and cell structure begins to break down and the leaves appear yellow and brown to the human eye, while in the near-infrared reflectance is reducing because of	cell break down. The "cyan" fields are devoid of vegetation and hence have low near-infrared reflectance. The cyan colour is produced by the combination of blue and green, which means the empty fields have similar green and red reflectance and hence, what we are seeing is bare soil. Question: Even though there are very few, some of the fields appear red in August, but cyan in May. Why do you think this is? Different agricultural crops, have variable planting and harvesting dates, which also depend on the climatic conditions. Even though most are planted in late spring and harvested at the end of the summer, some are planted in summer and harvested in autumn. In the case of those crops, the fields would appear empty in May, but full of vibrant vegetation in August.